Olympia MotoQuest: Gear for Globetrotters! Olympia is the official gear sponsor of MotoQuest Tours, a tour company known for epic tours that need epic gear. MotoQuest offers tours in various locales all over the world and they need gear that will match different climates from Alaska to Vietnam and everywhere in between. The versatile MotoQuest Jacket and Pants combo is what serious motorcyclists need to take on unknown weather conditions. The MotoQuest Jacket's versatility comes from its "Three Layer Systems Design". Each layer helps to stack the deck in favor of the rider when gambling against mother nature. Layer One of the Olympia MotoQuest Jacket is the outer shell that offers abrasion resistance and adjustable airflow thanks to the Mega Vent Panel system. Large swathes of the jacket open up to provide mesh venting for maximum airflow. Temps dropping during your mountainous ride in the Andes? No problem. Just adjust the textile panels to keep your body heat in. Olympia is one of the few manufacturers that offer a jacket fully outfitted with CE certified armor for the elbows, shoulders, and back. Most of the time you are looking at the back protector as a separate purchase. The shell features a zip off integrated back pack that can hold a 2 liter hydration bladder. There are seven storage pockets and an oversized waterproof storage pocket on the back. Layer Two is a wind and water resistant Thermolite insulated liner. You can use this layer as a stand alone destination jacket. No one at that Christchurch bar has to know that you are touring South Island New Zealand on a motorcycle. Layer Three is an entirely separate rain jacket with a stretch knit hood that can be worn underneath a helmet to keep rain from leaking down your collar. This layer can be worn both over or under the outershell. The Olympia MotoQuest Pants have one less layer compared to the jacket. Layer One of the pants control airflow just like the jacket with its Mega Vent Panels. 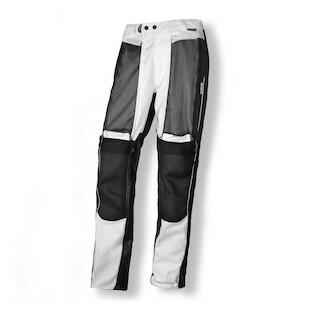 The pants can be worn as a traditional riding pant or an overpant thanks to its side zippers that go all the way up to the waist. The CE rated knee armor can be adjusted to 3 positions and the EZ hem bottom allows riders with tall or short inseams to customize the pant to their body type. Leather reinforcement panels run the length of the inner thigh to provide a barrier from those hot engine parts. The trousers come with a rain pant that acts as Layer Two. This can be worn over or under the outer shell. Touring through South Africa backroads requires gear that is functional in different situations. The limited space on a bike is valuable and bringing along extra gear is not an option. 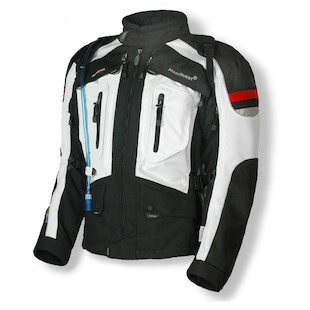 Olympia's MotoQuest Jacket and Pants are for the riders that need their gear to do everything. Whether it is the commuter who only wants to invest in a single jacket and pant to use all year round or the motorcycle wanderer who is carrying all he owns on his bike while he circumnavigates the globe.